After writing about Irish success in the Great Taste Awards last week (I was also delighted to hear that my favourite Ummera smoked chicken took a Gold award), I was interested to receive this press release (see below) about the just-launched Irish Food Awards. It was only a matter of time before Kieran Murphy’s entertaining Ice Cream Ireland made it to the printed page. 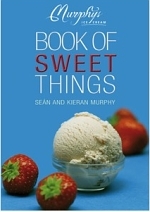 The Book of Sweet Things, written by Kieran and his brother/business partner Seán, tells the story of how two Americans got into the ice cream business in Dingle a few years ago. Now Murphys’ Ice Cream is sold from two shops – one in Dingle and the other in Killarney – and their distinctive blue and white containers are stocked in delis and foodstores throughout Ireland. I got my first taste of their wares by picking up a tub of vanilla (or fanaile) in Morton’s of Ranelagh; now, fortunately, I’m never too far from a freezer-full of varieties at work in Urru.